Rollout Of Chevy Bolt May Mark Turning Point For Electric Car Market : All Tech Considered The Chevy Bolt can go 238 miles on a single charge and costs about $30,000, after a federal tax credit. But the clean-car industry needs government support to thrive, and that's far from certain. 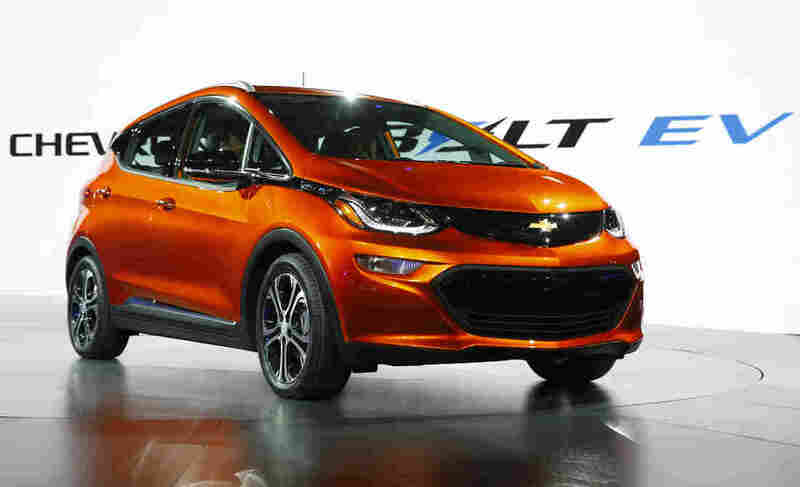 General Motors has high hopes for the Chevrolet Bolt EV (shown here during its debut at the North American International Auto Show in Detroit last year). It can travel 238 miles on one charge. Currently, the only other all-electric cars with that kind of range are Teslas, which are far more expensive. The Chevrolet Bolt EV, which is now hitting the market, could be the first of a new wave of game-changing electric vehicles. Its longer range and lower price could attract new buyers to the electric car market, but there's uncertainty over whether federal tax incentives will continue and whether California will be allowed to keep tougher emissions rules under President Trump. GM is marketing the Bolt as a small crossover. It has the footprint of a subcompact and the interior space of a standard car. More important are its range of 238 miles and price tag of $30,000, after the $7,500 federal tax credit offered on electric vehicles. Currently, the only other all-electric cars for sale with that kind of range are Teslas, which cost upwards of $70,000. "In all our research, we've talked to consumers, and really that 200-mile EV range at the affordable price was kind of the tipping point for them to really consider this a mainstream vehicle, so we went after that," says Darin Gesse, product manager for Chevrolet Electric Vehicles. GM is rolling out the Bolt in phases: It's currently available in California, Oregon, Maryland, Virginia and Massachusetts and will be in all 50 states by the fall. Like other all-electric cars, it has no tailpipe. As for fuel efficiency, the EPA gives the Bolt a rating of 119 MPGe, or miles per gallon equivalent. But without some environmental motive weighing in the balance, does the bottom line check out? We asked a few people who had stopped to look at the Chevy Bolt at the Washington Auto Show earlier this month. Jack Cheng of Potomac, Md., already drives an electric car, a BMW i3. He is impressed with the Bolt's longer range, but less so with its price. "For the price of the car versus what you get, you probably don't come out ahead," Cheng said. For him, the selling point is the environment; he likes the fact that he's not polluting. Price is also an issue for David Manfredi of Davidsonville, Md. "It's just expensive," says the electrician, who currently drives a Toyota 4Runner SUV. Manfredi hopes to cut the cord on oil and gas, so he is looking at not just the Bolt but also the Volt, Chevy's plug-in hybrid. Manfredi says he couldn't consider either car without factoring in the $7,500 federal incentive. "That's a huge credit, so if that disappears then I think we'll have to disappear from the market." Clean car advocates are concerned about the future of electric cars under the Trump administration. Could the $7,500 credit disappear in a new tax bill? Will Washington continue to spend millions on battery research? And then there's uncertainty over whether President Trump's EPA will continue California's waiver for tougher car emissions rules. Washington permits California to set stricter emissions standards. Nine other states have gone along with Sacramento, adopting Zero Emission Vehicle regulations, or the so-called ZEV mandate. Automakers have to sell a certain number of electric vehicles, often at a loss, to sell profitable internal combustion engine cars. "The consensus is that nobody knows what the heck is going to happen next. Nobody," says Dan Neil, auto columnist for The Wall Street Journal. "And the sense of uncertainty is really weighing hard on an industry that is capital intensive, long-term planning. They don't like uncertainty in the auto industry." Simon Mui, who works on energy and transportation issues at the Natural Resources Defense Council, says government support is still critical to the electric vehicle market. He says without subsidies, it's likely going to be 5 or 10 years before electric cars are price competitive with gas-powered vehicles. "Today, with incentives, you're very close to that point," he says. "Consumers that are charging on electricity, if they charge off-peak, they're basically paying a buck a gallon equivalent. So they're seeing much lower fuel bills overall." Mui makes another argument for government support of the clean car industry: the jobs that come with it. In 48 states, he says, American workers make components for fuel-efficient cars. "These are red states. These are blue states. These are purple states, employing hundreds of thousands of people making technologies not just for clean cars in the U.S., but clean cars globally," he says. China and Europe are big, regulated markets for electric cars. Mui says lowering the bar for American automakers by dialing back emissions standards would hurt the U.S. competitively. There are now some 30 models of electric and plug-in hybrid cars available in the U.S. Last year, sales of these vehicles rose by almost 40 percent, but they still only accounted for about 1 percent of all new car sales. Neil of The Wall Street Journal says that in part reflects a poor job of marketing them. "The marketing has been terrible, disastrous. It's such a lost opportunity. For one thing, automotive dealers have done a terrible job in the United States of explaining what electric cars are, they don't have them on the lot, so that's hardly their fault," he says. "A lot of these cars fall into a category of compliance vehicles, which are just there to meet the California ZEV mandate." Neil says he wishes more consumers knew that these cars are "a better way to make mobility." In the radio version of this story, we describe the Chevy Volt as a plug-in hybrid car that can run on gas when the battery is empty. To be more precise, when the battery is low on electric charge, the Volt switches to a gas-powered generator for the battery.